On my 19,947th day on earth, I learned something that came as a complete surprise: I am not invincible to injury. Racing down Mount Constitution in early October, the medial meniscus at the back of my knee detached from the bone with an unmistakable (but not painful) “pop.” A month later, I broke my arm. 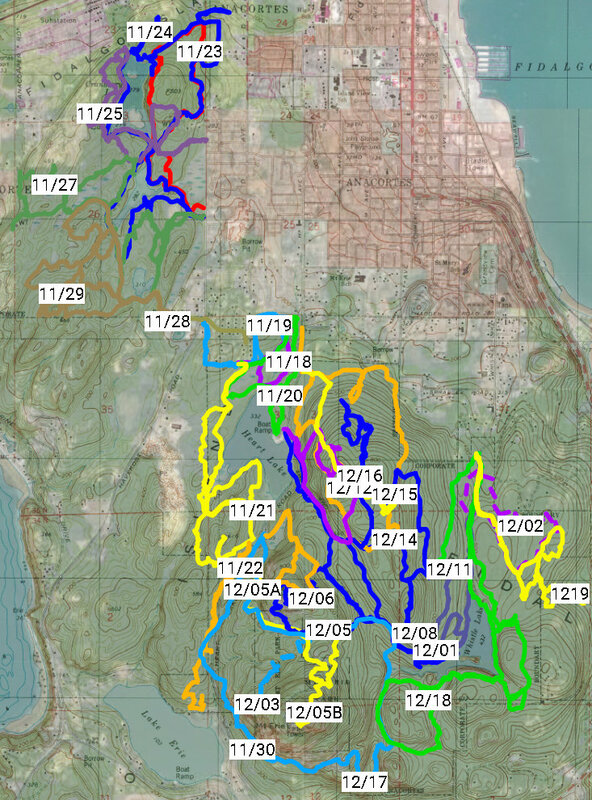 With a minimum of six weeks of restriction from sports, it was the right time to attempt a quest I’d been contemplating for several years: hike all 57 miles of trails in the Anacortes Forest Lands (ACFL). Doing so would allow me to stay in some semblance of shape as well as traverse several miles of unexplored trails. I decided to begin at Heart Lake, the area with the flattest, fewest trails (10 miles); move to Little Cranberry (17 miles); and finish up at Whistle, which boasts the steepest, most (30 miles) trails. Ski-hill-like symbols on the back of the ACFL maps, “easiest,” “more difficult,” and “most difficult,” accompanied by a brief description confirm what’s easy for anyone familiar with the area to figure out herself: the highest concentration of physically and technically easy trails of the ACFL’s 2,800 acres are located at Heart Lake, which is where I began my quest. Trail 210, accessible from the main parking lot, loops most of the way around the lake and is one of my favorites for several reasons: (1) it meanders past a number of old growth Douglas Firs south of the lake; in the fall it’s home to one of the most noticeable mushrooms–Fly agaric, easy to identify with its bright red cap and spikey beige spots; (2) near the parking lot and the junction with Trail 224 grow Black Cottonwood trees, which boast beautiful spade-shaped leaves that transform into a gorgeous golden color before joining those of the Bigleaf Maple, Western Redcedar foliage, pine needles and other stuff that creates a colorful carpet on the forest floor every fall. I covered part of this trail on the 20th of November and finished it off the following day. Sometimes what seems like it’s going to be awful turns out to be awesome, which was true during much of the time I spent near Little Cranberry Lake. On the 25th, minutes after yielding to two horses, I noticed an old, typical-size pile of horse manure littered with tiny protrusions, which turned out to new-to-me, the snowy inkcap. Two days later, I headed south and west towards Trail 137, the only one on which I’d never walked, after nighttime rain that changed to morning drizzle. Pacific tree frogs called intermittently, and as I passed Mitten Pond: the siren call of hoo-ing owls beckoned. Great Horned owls had recently been seen in the area and after listening to Bob Jepperson’s soundtracks, I suspected that species. Time-constrained, I continued towards my original destination, where I arrived in time to see the sun rising between the trees. As I backtracked along Trail 10, I heard an unfamiliar sound, the quietest of quacking in an area littered with deciduous tree leaves wet with the night’s rain–possibly that of a wood frog. From the same spot, I watched a confident Douglas squirrel demonstrate the proper way to deseed a cone from a Douglas Fir tree, its primary diet, and namesake. The last day in November, I hiked the quarter mile long Ray Ault Trail (214), which scared the heck out of arm-casted me with its steep-ended accesses along Mt Erie Road. It was worth it for the section that passes a craggy rock face, but I wouldn’t do it again without full use of my appendages. Three days later, I proceeded further up the same road and to check out another unfamiliar trail: 239. The map indicates 0.5 miles, but the fun didn’t begin (with a steeper section and a brief glimpse of a retreating barred owl) until after I passed the half-mile mark. And it was another quarter mile to end with a view towards the southwest of Lake Erie. During what was left of the fourteen days I spent here, I continued to encounter one species of birds more than any other: the robin-sized, super shy Varied Thrush with their “blue-gray on the back and rich burnt orange below,” which retreated immediately each time, departing with conspicuously loud wingbeats. In addition to the thrushes and a couple of owls, I encountered at least a dozen species total of woodpeckers, ducks, sparrows, wrens, herons, eagles and an errant Trumpeter swan (in Big Beaver Pond), which was easy. The ACFL is home to as many as 65 bird species. During one the last days with my cast, I bit off more mileage than I could chew before dusk during what turned out to be a nearly three hour venture that ended with me carefully picking my way along the trails in the dark hoping that my phone’s flashlight wouldn’t die before I found my car (it didn’t). When I tallied up the total distance of ACFL trails on which I’d never traveled before, it came to a mere four miles. Windy weather threatened to delay the completion of my quest, but with only days to go until the cast would come off, I braved (or foolished) death by windthrow in order to catch ’em all. Trees swayed, branches flailed, and the fronds of sword ferns, probably the most common herbaceous plant in the Forest Lands, waved. In my meanderings, I’d considered these prolific plants to be as unremarkable as they are ubiquitous. Were they trying to tell me something? I found them in one of my favorite books Plants of the Pacific Northwest Coast where I learned, “Sword fern leaves were used by the northwest coast peoples as a protective layer in traditional pit ovens, between food in storage boxes and baskets and on berry-drying racks. The leaves were also used for flooring and bedding. The large rhizomes were dug in the spring and eaten as a starvation food by [several tribes]…” Ancestors of these unassuming plants had saved people’s lives! Maybe they were waving to nudge me towards insight. I spent 27 days covering 80 miles of trail, during which I encountered hundreds of the thousands of species of flora and fauna that live in the ACFL, but the thing that left the biggest mark on me was a common plant. The sword fern reminded me that everyone has an important backstory that can be learned with a little effort. Thanks to my sister JoDee for suggesting this title. What a story, and so well told. I can relate to the broken arm and walking some of those trails, but not to both at the same time. 🙂 I love seeing these views – the one across Cranberry Lake (I think) of all the Doug firs lined up along the edge and reflected, the views from Mt. Erie, the burned trees at Cranberry Lake, the yellow Cottonwood leaves, that fungus at the beginning, and the reflection towards the end – not to mention that last photo. I don’t know how you did it, but I’m glad you did and lived to tell the tale. It’s great to hear from you. Thank you for taking the time to send me a note. You are right (it is Cranberry). And although the last couple of weeks weren’t so bad, the first few (hiking with casted arm) days were a bit tricky. I took about 100 photos during my quest, so it was hard to narrow it down to these few. I’m glad that you enjoyed them.